Decorating with artwork is one of the quickest ways to create style and personality in your home at Springs Apartments. It can be used to accent a particular decor such as modern or traditional, or you can use a funky, eclectic mix that reflects your individuality. Do you love the idea but think that original artwork is outside your budget? Thanks to the Internet, you have access to virtual art galleries from all over that offer a wide variety of art at affordable prices. You might even "discover" an emerging artist ahead of the rest of the country. Here are some great sources to get you started. With the assortment of styles available, you're certain to find something that catches your eye. Animal lovers will go wild for The Animal Print Shop by Sharon Montrose. Collectors such as Elton John are the proud owners of her charmingly sophisticated photographs. She also has a series of baby animal prints that are perfect for a nursery or child's room. Jane Mount's unique Ideal Bookshelf features hand-painted pictures of the spines of popular books. Get a "themed" bookshelf such as Jane Austen or Harry Potter or a custom painting of your own favorite books. 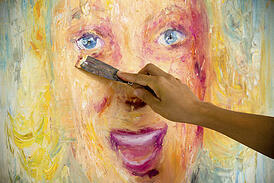 A group of executives from eBay started Zatista specifically as a source for affordable art. All artwork is original and the store offers free shipping as well as free returns. ArtRiver sells limited edition prints from a mix of artists including well-known names and up-and-comers. Hang a Jackson Pollock or Andy Warhol in your home for prices starting as low as $29. Your purchases help support worthy causes at Tiny Showcase. This site promotes new artists by selling their limited edition prints. A portion of each sale is donated to a charity of the artist's choice. Art doesn't have to be restricted to the walls of your home. Society 6 sells screen-printed accessories such as duvet covers, shower curtains, throw pillows and wall clocks. Minted takes a democratic approach to developing their inventory. They conduct ongoing design competitions and allow the online community to vote on which pieces to sell. San Francisco-based UGallery was founded by a trio of friends as a way to promote works from college students and recent graduates. Its success prompted them to expand, incorporating works from mid-career and emerging artists. Have fun browsing for just the right pieces to bring your vision to life. Did you make an amazing find on one of these sites? Tell us about it!